A majority of Americans believe climate change is taking place and want the federal government to do more about it, according to a national poll released by the Monmouth University Polling Institute and Urban Coast Institute on Jan. 5. The poll was conducted from Dec. 10-13, as the historic COP21 climate change conference in France wound to a close. 70 percent believe climate change is real. 60 percent view climate change as a serious problem. 64 percent believe the federal government should be doing more to combat climate change and sea level rise. 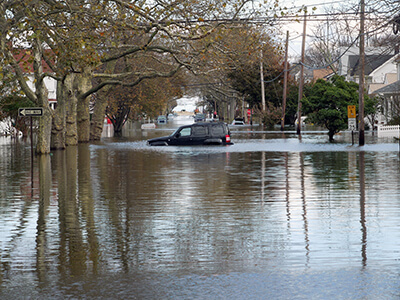 65 percent of inland state residents believe sea level rise will impact their economy and environment as much as coastal areas. Read the press release here to see the results in their entirety. Below is a sample of the media coverage of the UCI following the release of the Jan. 5 Monmouth Poll measuring Americans’ attitudes toward climate change. 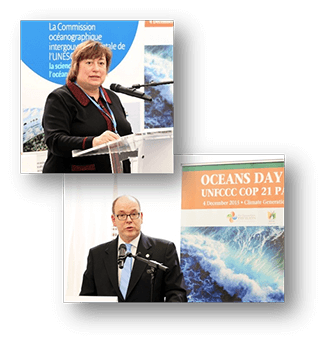 The Monmouth University Urban Coast Institute was proud to be a partner in convening Oceans Day at COP21 on Dec. 4. Thousands of official government delegates, observers, politicians, non-governmental organizations, businesses and environmental groups met on a special “campus” that was constructed in Le Bourget, just outside of Paris, to house the negotiations on the United Nations Framework Convention on Climate Change (UNFCCC). The objectives of Oceans Day were to raise awareness and political support for recognizing oceans as a critical issue in the climate negotiations, provide recommendations for key actions, and foster political leadership and mobilize collaboration to guide policy and action on the oceans and climate. Prince Albert II of Monaco, Mary Robinson, President of the Mary Robinson Foundation and former President of Ireland, and Ségolène Royal, French Minister of Ecology, Sustainable Development and Energy, addressed attendees, stressing the need for decisive action on climate that also fosters ocean conservation and resilience, supports human rights and dignity, and recognizes the need for sustained commitments. Rhode Island Sen. Sheldon Whitehouse underscored the call for action and reassured the international partners that the Obama Administration and his colleagues in the Senate were committed to supporting strong action in the UNFCCC. Quoting Pope Francis, Whitehouse said, “Nature never forgives” and added, “We need to get this right.” It was a particular pleasure to see New Jersey Sen. Cory Booker who also took the time (apparently coming straight from the airport) to join us at Oceans Day. It was a full day of high-level presentations, with panel sessions addressing topics such as the effects of climate change on oceans and coastal and small island developing states (SIDS), climate change mitigation strategies, financing adaptation efforts, and capacity development focusing on the needs of developing states. View the full Oceans Day agenda. Among other highlights, Manuel Pulgar-Vidal, the Minister of Environment for Peru, described moving from the 1992 Earth Summit to the recently adopted U.N. Sustainable Development Goals, which includes a specific goal for the oceans, and now to UNFCCC COP21, underscoring the continued relevance of the oceans. Tommy Remengesau, President of Palau, recounted actions taken to protect 500,000 square kilometers of ocean off his nation’s coast. Catherine Novelli, U.S. Under Secretary of State for Economic Growth, Energy, and the Environment, discussed the critical ocean threats we are facing and called for a durable climate change agreement, low-carbon economies, ocean resilience and worldwide monitoring. There was a minor moment of drama when Dr. Margaret Leinen, Director of the Scripps Institution of Oceanography and a representative of the Consortium of Ocean Leadership, stood up to inform the group that the UNFCCC negotiators who were meeting at another section of the Le Bourget site had stripped out important ocean language from the Preamble, and urged the Oceans Day participants to contact their delegations to restore it. A draft text of the UNFCC was delivered to the environmental and economic ministers for deliberation on Dec. 5. Stay tuned to future blogs for the fate of the ocean language and other critical UNFCC negotiations that are scheduled to take place this week. The player lined up with his golf ball in the 14-foot deep water hazard. Slowly, deliberately he took a shot — a hole in one! The crowd burst into applause. “It’s concentration, patience and luck,” Urban Coast Institute Marine Scientist Jim Nickels assured onlookers. This feat of skill was not accomplished on the links, but in the Monmouth University campus pool. Professor Nickels was leading students from his field methods in marine science course in a series of mini-golf and obstacle course challenges on Dec. 4 using remotely operated underwater vehicles (ROV). The activities were part of their training to operate ROVs for exploration purposes in marine environments. The UCI maintains three ROVs, which it has used for jobs such as archaeological investigations, pipe surveys, equipment recoveries and mapping offshore reef sites, Nickels said. The ROVs have assisted students and faculty members, government agencies, consulting and engineering firms, nonprofits and other institutions in their research projects. 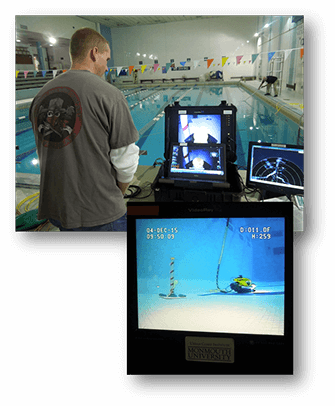 One of the ROVs was purchased with grant funding from the Fairleigh S. Dickinson, Jr. Foundation and the others have been provided for temporary training purposes by manufacturer VideoRay. The students were using front claw attachments to pick up the balls and thread rope lines through a small metal loop. Among the other attachments maintained by the UCI are a laser light projector for taking measurements and water quality monitoring equipment. View an album of photos of the activities on the UCI’s Facebook page. To learn more about the ROVs and other UCI marine science tools and technologies, visit our Research Vessels, Equipment and Field Activities page. The UCI is making valuable use of the incredible intellectual asset that surrounds it each day – Monmouth University’s highly skilled student body. Adam Schwartz and Kelly Young, students in Professor Karen Bright’s Advanced Project graphic design course, have been lending their talents to the UCI since September, helping create products like a 10-year anniversary icon (see image to the right), a trifold brochure, fact sheets, website graphics and more. As part of the course, students attach to a nonprofit organization and assist with their design needs over the course of the academic year. While organizations like the UCI benefit from the assistance, the students build their portfolios and develop hands-on professional experience serving real clients – a great example of the kind of immersive learning opportunities promoted in Monmouth University’s strategic plan. The UCI welcomes opportunities to work with students of all academic disciplines, whether through research programs like the Marine Science & Policy Initiative or individual projects with classes. In the fall, students from Professor Richard Bastian’s Statistical Consulting course began working with the UCI to analyze data collected through a survey of recreational boat owners in the Mid-Atlantic region. Students in this course take on real clients who need help with mathematical components of their work and projects. The collaboration kicked off in October, when the class interviewed UCI Communications Director Karl Vilacoba to learn more about the survey’s background and the UCI’s needs for the project. The survey, which was completed by a consultant, queried non-commercial boat owners from New Jersey, Delaware, Maryland and Virginia over the course of several months about their boating expenses and activities, as well as the extent of any vessel damage they may have sustained during Hurricane Sandy. The students have been extrapolating the results of the survey questions from raw coded data using the IBM SPSS software program and presenting the figures in easy to follow tables. Once the analysis is complete, the graphic arts students will create a series of infographics based on the data. Those products and a full summary of the survey data will be released in a UCI report in 2016 that examines the economic impact of recreational boating in the Mid-Atlantic. Stay tuned in the months ahead for more updates on the project. 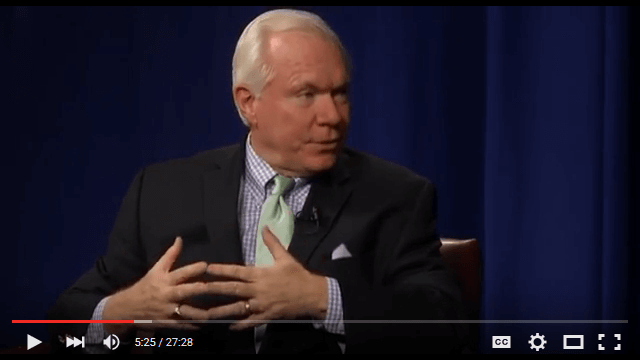 UCI Director Tony MacDonald discusses his recent trip to the ‪‎COP21‬ ‪‎climate change‬ conference in Paris, the importance of regional ocean planning, the Mid-Atlantic Ocean Data Portal and much more on “Community Connections” with Long Branch Mayor Adam Schneider. The episode began airing in the ‎Long Branch‬ area in January on Comcast local cable access TV. A special thanks to the student team at the Monmouth University TV studio for their great work filming and producing the show. 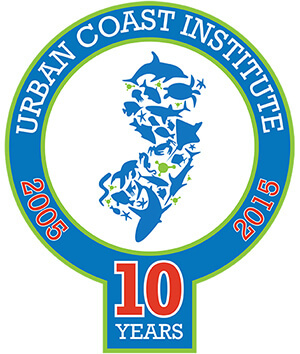 UCI staff will join representatives of government agencies, nonprofits and academic institutions in Dewey Beach, Delaware, on Jan. 29 for discussions on a series of research projects that will be used to help develop a regional ocean plan for the Mid-Atlantic. The public is invited to attend the forum, which will be hosted by the Mid-Atlantic Regional Council on the Ocean (MARCO). A comprehensive Marine-Life Data and Analysis Team (MDAT) study of marine life in the region. A Human Use Spatial Data Synthesis (HUDS) project that will gather information on the many places and ways that people interact with the ocean. The Regional Ocean Assessment (ROA), a wide-ranging analysis of data that will identify important trends that should be considered in the ocean planning process. Data from these products will also be incorporated in the Mid-Atlantic Ocean Data Portal (http://portal.midatlanticocean.org), an ocean mapping site and information center managed by the UCI with MARCO and several other partners. The UCI’s Dr. Michael Schwebel mapped out the issues of climate change and coastal resilience at a workshop geared towards informal educators on Jan. 13. The educators, who provide programs on Sandy Hook on behalf of the New Jersey Sea Grant Consortium (NJSGC), gained information on climate change, its specific local impacts and how to relate the information to the many K-12 student groups who they instruct during field trips to the peninsula. 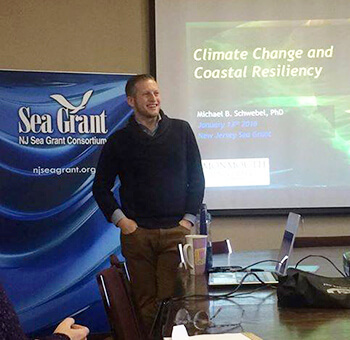 Dr. Schwebel serves as the community resilience and climate adaptation specialist for both the UCI and NJSGC. The presentation was delivered to an audience of about 30 at the NJSGC’s headquarters at historic Fort Hancock. The workshop also featured a game designed to encourage players to consider how to prepare for major coastal storms and unpredictable conditions. UCI Director Tony MacDonald is featured on KeepTheOceanWorking.com, a new website dedicated to raising awareness of the importance of ocean planning. Check out Tony’s profile here and browse around for stories about others who are working together for the future of the ocean and the economy. 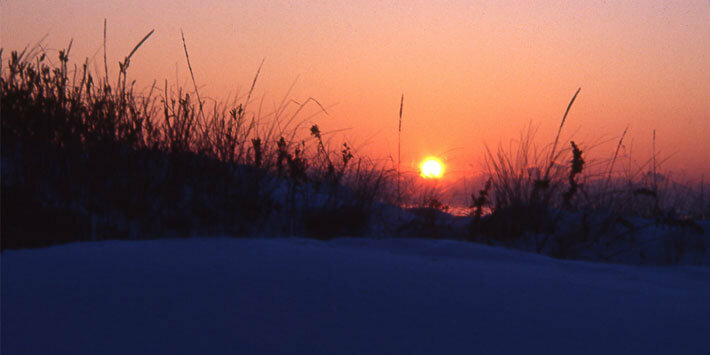 The site contains information about efforts to develop ocean plans throughout the U.S., with a particular emphasis on the Mid-Atlantic and Northeast regions. 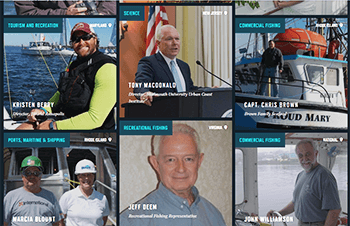 It tells the stories of professionals involved in the aquaculture, commercial fishing, ports/shipping, recreational fishing, renewable energy, science, tourism and recreation industries. The application period for grant support through the UCI’s Marine Science and Policy Initiative is well underway, with the first funded project of 2016 selected and several more expected to come in the spring. The Initiative was launched in 2014 to create new opportunities for Monmouth University to conduct research and policy analysis, enhance student experiences in and out of the classroom, and support community stewardship of coastal and ocean ecosystems. The UCI recently awarded its first Initiative-funded Graduate Assistantship to Morissa Schwartz (pictured at right), an exceptional student in the Monmouth University Corporate and Public Communications graduate program. 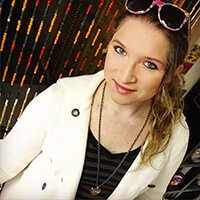 Over the spring semester, Morissa will meld her writing and communication skills with her passion for small businesses and coastal sustainability through the development of a Coastal New Jersey Small Business Website. The website will explore the main streets of our coastal towns, highlight some of the businesses that populate them and encourage site visitors to “shop local” and “shop small” ― practices that contribute to the sustainability of these towns as well as to an overall strategy against global warming. The UCI is also reviewing several Faculty Assistance Grant and Mini-Grant applications submitted through the Initiative for projects that will provide hands-on opportunities for MU students and staff while furthering the goals of the University and UCI. Applications for summer research opportunities will be accepted through April 1. For more information about the Marine Science and Policy Initiative and funding opportunities, please visit www.monmouth.edu/uci/mspi/.